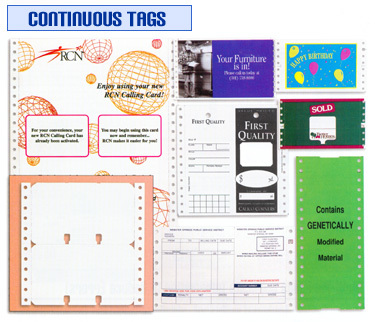 Custom Continuous Tags are available single or multi-part in hundreds of sizes to fit your needs. Print up to eight colors on single part tags and choose from a variety of tag materials. Special features such as back printing, punching, numbering, bar codes and extra perforations are available. Continuous tags can be fan-folded or on rolls!